For those applications where being seen is of the utmost importance, MCR Safety's Luminator Series offers you a variety of high visibility garments made in different colors and different options of reflective material. 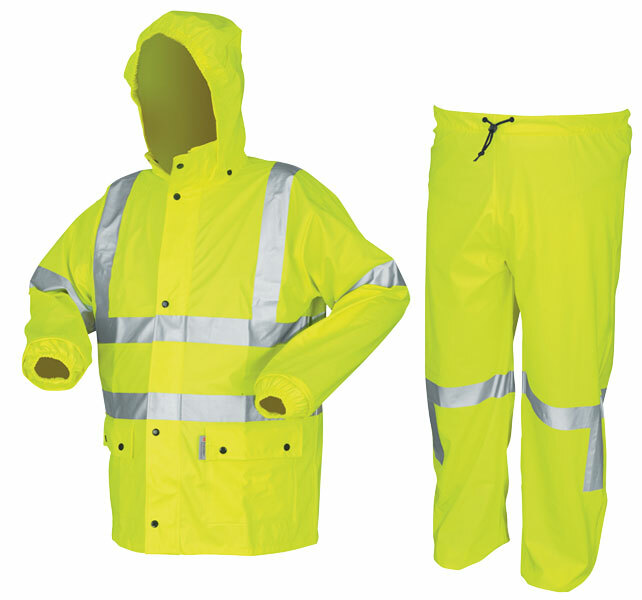 The 5182 is a fluorescent lime 2 pc suit made up of a jacket with attached hood and elastic waist pants. It features 2 inch silver reflective stripes and meets or exceeds ANSI/ISEA Class 3 high visibility standards. The jacket has a zipper front with storm flap, 2 front patch pockets, and elastic inner cuffs in the sleeves. The pants feature a drawstring elastic waist and have expandable ankle gussets. This garment is treated to be limited flammability and has been tested in accordance with the ASTM D-6413 test method. This garment is not flame resistant as defined by ANSI/ISEA 107-2015 Section 10.5. For more information on Limited Flammability, Click Here.